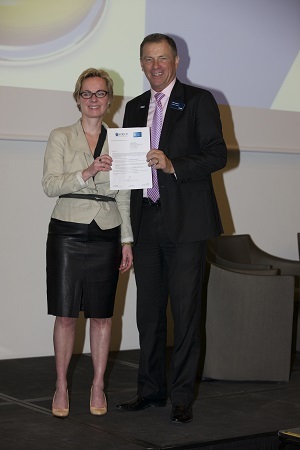 Paris, FR – 28 April 2015 – Financial Planning Standards Board Ltd. (FPSB), owner of the international CERTIFIED FINANCIAL PLANNER certification program outside the United States, was recognized as an affiliate member of the OECD International Network on Financial Education (INFE) at FPSB’s April Global Member Meeting in Paris. At the same meeting, FPSB’s network of CFP certification bodies endorsed OECD-INFE’s Guidelines for Private and Not-for-profit Stakeholders in Financial Education, which define a framework and criteria for a nonprofit body involved in national financial education strategies and programs. Additionally, during the FPSB meeting hosted by FPSB’s local affiliate Association Française des Conseils en Gestion de Patrimoine Certifies (CGPC), Verena Ross, Executive Director of the European Securities and Markets Authorities (ESMA), addressed the FPSB Board and leaders of FPSB’s European member bodies on: Europe’s regulatory environment; the implications of MiFID II for the financial advice/planning community; and opportunities for participation by CFP professionals and other financial advisers in ensuring appropriate levels of care and protection for those seeking financial advice in Europe. Since FPSB was formed over 10 years ago, the number of CFP professionals has grown to almost 160,000 in over 26 countries and territories worldwide. At the Paris meeting, the FPSB Board and member organizations agreed on the need to grow the footprint of competent and ethical financial planners in existing and new FPSB territories to better address the global community’s need for competent and ethical financial planners. The group set a provisional target of 250,000 CFP professionals in 40 territories by the year 2025, and agreed to finalize the target by year-end after assessing territory-specific growth opportunities and challenges.